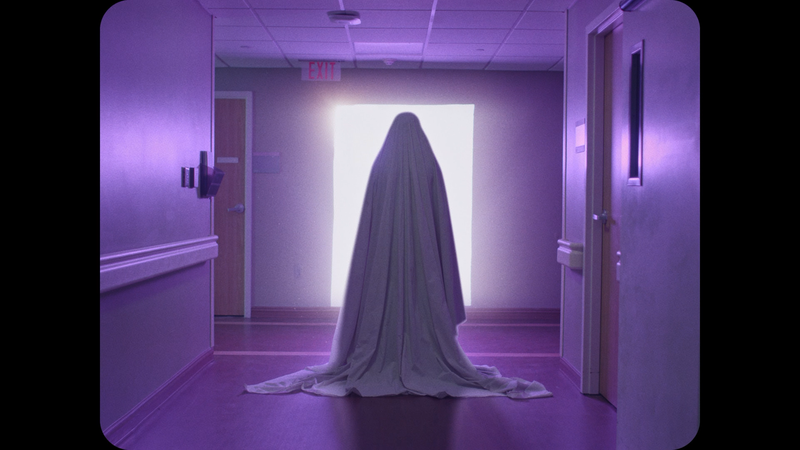 As the first 30-minutes went by in A Ghost Story, I became really concerned the remaining hour would be a snooze-fest or worse, instead, it was evocatively beautiful with some clever sequences that did manage to keep me captivated to the bittersweet end. A Ghost Story is the kind of movie you shouldn’t watch in the dark. No, not because it’s scary, but if you’re tired, you just might doze off within the first 30-minutes. 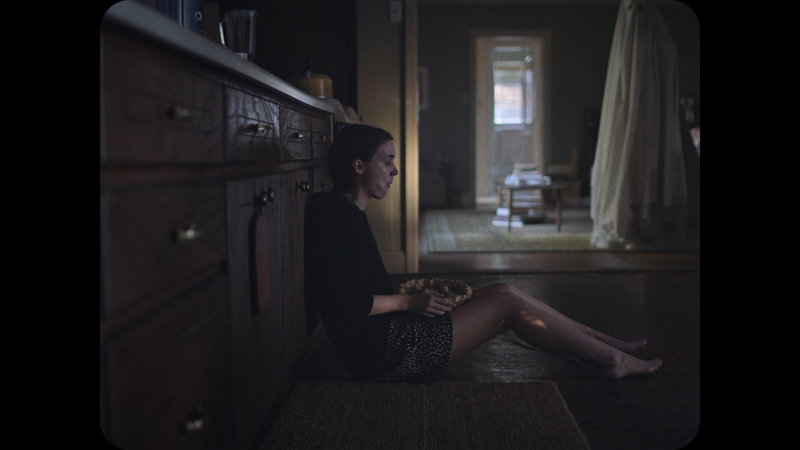 It was at that point, I feared this was turning into a boring Terrence Malick movie with plenty of imagery — there is a full 5-minutes where we watch Rooney Mara eat a pie — and little substance. But once we get beyond that, the long sequences are replaced with quicker pacing, and I found myself a bit more involved with the story. The plot revolves around a married couple, referenced only as C (CASEY AFFLECK) and M (ROONEY MARA) in the end credits, who are at a crux in their relationship, as we learn, one wanting to move, the other against it. One morning, and we only see the aftermath, C is killed in a car crash. At the hospital M identifies the body and makes her peace before leaving. 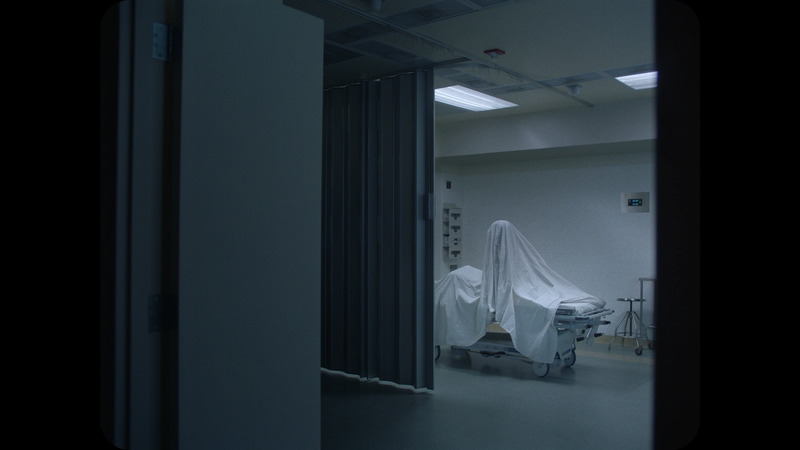 In one of the early long scenes, the sheet rises up and starts roaming the hallways, eyes cut out, but clearly no one sees him. A doorway of light opens but he refuses to go through and eventually goes back home and observes the daily routine of M as she grapples with her loss and, eventually, moving on. I actually enjoyed A Ghost Story once it got passed the 30-minutes of long, tiresome scenes. It was actually quite hauntingly beautiful, stimulating and poignant. And what’s most notable is, it’s not due to the performances; both Casey Affleck and Rooney Mara are perfectly fine in their respective roles but given each are only in it for maybe 50% of the film, if that (and I’m not completely sure Affleck was even underneath the sheet the entire time), it’s understandable that their characters don’t get their due. Instead, the movie really works with the atmosphere from writer-director David Lowery and his cinematographer, Andrew Droz Palermo (You’re Next, The Road). 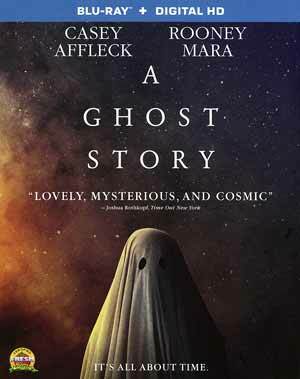 A Ghost Story is a film that one should not judge by the cover. You see a spooky, if not classic, sheet-covered being and one would think it’d have some scary scenes, but instead this is a slow-moving, thought-provoking film that’s more about love and time with some clever shots and scenery, particularly throughout the third act, it was both impressive and, frankly, heartbreaking at the same time. Audio Commentary – Writer/Director David Lowery, Cinematographer Andrew Droz Palermo, Production Designer Jade Healy and Composer Daniel Hart. This is a crowded field but each gives information on their field of expertise. One interesting tid-bit: the pie-eating scene, the ghost in the background was shot separately. A Ghost Story and the Inevitable Passing of Time (20:20; HD) has the filmmakers, and Casey Affleck, sitting in a haunted attic, and chatting about where the idea for the movie came from. Includes some behind-the-scenes pictures. A Composer’s Story (4:37; HD) – Daniel Hart takes audiences through the process of scoring and using the song, ‘I Get Overwhelmed’. Deleted Scene (5:56; HD) – This scene, which was unaltered, is just one of those mundane sequences. A Ghost Story haunts its way on Blu-ray courtesy of Lionsgate and is presented in its original theatrical Full Frame 1.33 aspect ratio. The picture looks good, detail is nicely defined and colors are generally bright, though it does move more towards natural tones and even daylight shots are shrouded in shadows and darkness. Black levels meanwhile look fine as well but not too bleak. The disc comes with a standard DTS-HD Master Audio 5.1 track. Other than some of the haunting music/score and some dialogue, which does come through with clarity, the bulk of this film is actually… silence. There is some ambient noises here and there (like wind) so the front and rear channels do get some usage, but otherwise it’s not exactly the best sounding movie, not that it needs to be. Overall, as the first 30-minutes went by in A Ghost Story, I became really concerned the remaining hour would be a snooze-fest or worse, feel like a Terrence Malick film. Instead, the remaining time was evocatively beautiful with some clever sequences that did manage to keep me captivated to the bittersweet end. The Blu-ray release offers good video/audio transfers and a satisfactory selection of bonus features.